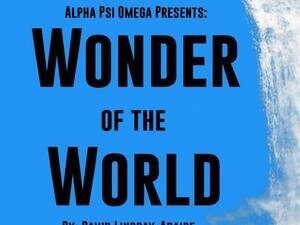 Alpha Psi Omega presents our spring play, Wonder of the World! In Wonder of the World, a woman named Cass suddenly leaves her husband Kip and hops a bus to Niagara Falls in search of freedom, enlightenment, and the meaning of life. She crosses paths with Lois, a blithely suicidal alcoholic, Captain Mike, a lonely tour-boat captain, Karla and Glen, a pair of bickering private detectives, and a clown therapist, and hears about a strange caper involving a gargantuan jar of peanut butter. Tickets will be sold at the door for $5 each or they are free with a Bentley ID! We hope to see you there!